Location: Anahuac National Wildlife Refuge, southeast of Double Bayou. 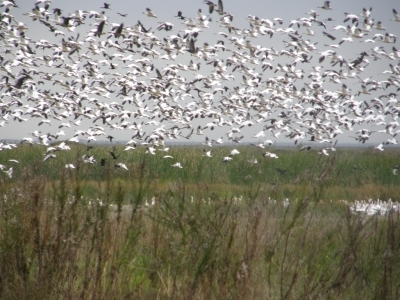 Located on Anahuac National Wildlife Refuge, the Willows Trail connects the Visitor Information Station and the Butterfly and Hummingbird Habitat Landscape to "The Willows," a popular destination for birders on the upper Texas coast. The coastal woodlot located at the Willows provides important stopover habitat for migratory birds making the 600-mile journey across the Gulf of Mexico each spring. The trail meanders through this coastal woodlot, freshwater ponds, a prairie restoration demonstration area and a landscape designed to attract butterflies and hummingbirds. These habitats offer outstanding views of migrating songbirds, wading birds, butterflies and a variety of other wildlife. The 0.8 mile Willows Trail includes a 1,000 foot stained and stamped concrete path leading to a 1,100 foot elevated boardwalk constructed of environmentally-friendly and long-lasting recycled plastic decking. This universally-accessible portion of the trail provides wildlife-viewing opportunities for people of all abilities. The remainder of the trail consists of a mowed grass path looping around the willows and leading back to the Visitor Information Station. The Willows Trail is located at the main entrance to the Refuge and provides students participating in the refuge's Outdoor Education Program, as well as all visitors, with excellent opportunities to experience the wildlife and habitats that occur on the refuge. The trail was made possible through a partnership with the Friends of Anahuac Refuge, the National Fish and Wildlife Foundation, the U.S. Fish and Wildlife Service, and many additional contributors and volunteers. Anahuac National Wildlife Refuge headquarters. Photo by WhisperToMe. 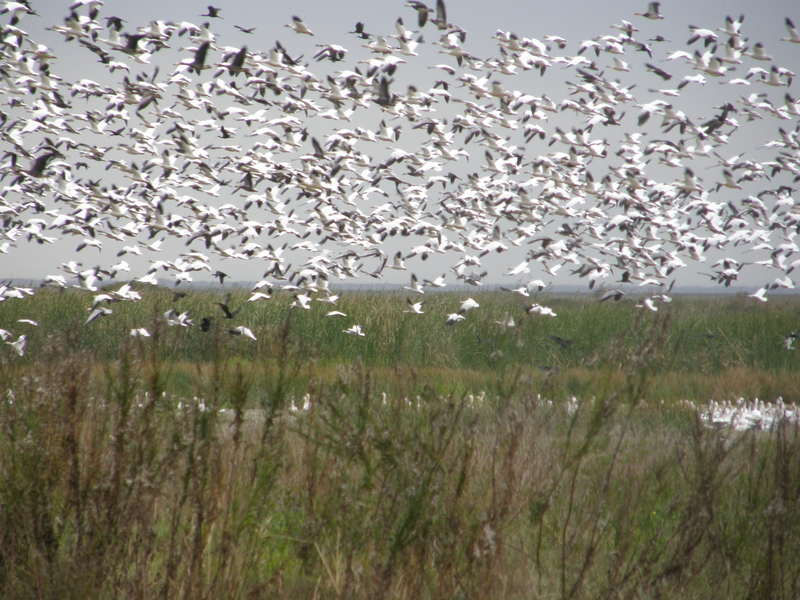 Snow Geese in the Anahuac Wildlife Refuge. Photo by Linda MacPhee-Cobb.